September 11, 2009 by Ken Ward Jr.
West Virginia University has announced that, in exchange for a $1 million donation for energy research, it has created a chair of mining engineering named after controversial coal executive Robert E. Murray. Bob Murray is a longtime friend and supporter of West Virginia University and of our College. This gift will enable our students and faculty to conduct the kind of groundbreaking research our nation needs to maximize our energy resources. 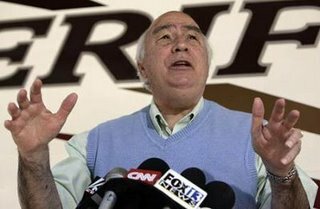 Murray is president of Murray Energy Corp., the largest privately owned coal mining company in the United States. A fourth-generation miner, Murray began supporting his family at the age of 16 after his father’s paralysis from a mining accident. He worked for the North American Coal Corp. for 31 years before establishing Murray Energy. Oddly, there was no mention of the August 2007 Crandall Canyon disaster, which killed six miners and three rescue workers at one of Murray’s Utah deep mines. MSHA fined Murray’s company $1.34 million for mine safety violations it said led directly to the deaths. Oh please! You can’t be serious. Ken this is not April Fool’s Day. A man with the reputation of Murray deserves a chair named after him? Well he didn’t deserve it, it appears that he bought it. I reckon that money always talks and ethics usually walks. Such a shame. They sold the chair for too low of a price. They should have asked him for a $1.34 million donation. Clem, where and why did you come up with the odd number of 1.34 million? Is there a meaning behind that number? As far as I am concerned the chair shouldn’t have been given for money anyway. Merit would have been better I think. The U.S. Department of Labor’s Mine Safety and Health Administration (MSHA) today announced that it has fined the operator of the Crandall Canyon Mine in Emery County, Utah, $1,340,000 for violations that directly contributed to the deaths of six miners last year. Agapito Associates Inc., a mining engineering consultant, was fined $220,000 for faulty analysis of the mine’s design. MSHA cited the mine operator for 11 additional, noncontributory violations issued as the result of the investigation. The proposed penalty for these violations is $296,664, bringing the total proposed penalties against the mine operator to $1,636,664. Crandall Canyon Mine is operated by Genwal Resources Inc., whose parent company is Murray Energy Corp.
How can you BUY a chair???? I don’t guess I should be suprised since this is the same University that hands out unearned degrees. Sorry folks, you overlooking the obvious. He’s attempting to buy a place in heaven. And in time, he’ll exhaust his fortune to meet this end. In a way, it’s sad. Most of the commenters do not know Mr. Murray. He has been a friend of WVU for many years. Keep your hate to yourself and accept his help for the school. Dell — WVU should know that Mr. Murray, no matter how good of a friend of WVU, has a highly tarnished public image since the Crandall Canyon disaster. If Mr. Murray’s motivation was to help WVU as much as possible, he would have made the donation anonymously. I think we should be grateful to Mr. Murray. He did not have to give anything. He just did. Lets face it. MSHA and the State of Utah killed those miners at Crandall Canyon. They issued the pillar plan. Should it have been issued? No, but I’ve seen worse things before. The management at the mine can even be blamed. The media was hard on Mr. Murray. No, I’m not related to him or know him. I also think the same way of Ben Hatfield. Mr. Hatfield was also given a raw deal by the media. Mr. Spade, it is not hate. It is just the facts that Murray has been less than honorable. I don’t think that just because someone gives money to a school that the person should be honored with a “chair”. It is sad when money can buy just about anything, however in many people’s minds money doesn’t buy honor. That in no way means that we “hate” the man. Honor is something earned, not bought. The blame for the Crandall Canyon disaster stops at Mr. Murray’s desk and no other. It was his mine and he- ultimately- is the boss. Since he was once a coal miner, he also knew the danger of “retreat mining”. There is no hate here. I find it strange that some of the “coal bosses” rant about the interference of MSHA and state safety officials until a disaster happens and then when the evidence of blame points to the coal company, the company immediately points to MSHA and the state. Might I add to the previous comment that MSHA was gutted under the Bush administration. Anyone who stood up against wrongdoings were severely punished. Jack Spadaro is an example of this. Jack is a good and honorable man, and look what they did to him. I sincerely hope that this administration does the right thing and holds the coal corporations accountable for breaking the law. Not a slap on the wrist, but hefty punishments for infractions of the law, and the people in MSHA who make sure that the laws are fully enforced to the limit should be rewarded. again pointing fingers to make sure people are remembered for the bad things that happen.wasn’t the donation for the good of wvu or was it just a payoff to try to make himself look good?he has no ties into west virginia and it’s coal,so what was the purpose of this?is that the only incident to happen on his coal propeties or does he have a bad safety record?you keep throwing in the bad,is there any good side or is he just another massey and blankenship? Ken has just posted on the very questions that you are asking. Murray has done more than a few dishonorable things. Go and read Ken’s latest posting about Murray and his donation. I will add nothing further even though there is plenty that could be said.